Energy efficiency measures are increasingly on the frontline of war-torn Ukraine’s fight to lessen its dependence on Russian gas, after the crisis that led to the Kremlin’s annexation of Crimea. Ukraine needs to import gas from Russia’s state-owned Gazprom for its domestic market, which includes 14 million households. Those households will have to pay for much-needed investment to the country’s aging infrastructure, with bills rocketing by nearly four times. Costs have traditionally been subsidised by the state but, with the Ukraine reeling from two international bailouts since 2008, customers will have to pay more. The price for consumers is set to increase to 1,590 Ukrainian hryvnia (about €65) per thousand cubic metres (kcm) from UAH 419/kcm (€17). Ukrainian politicians passed a law that households must have meters installed by 1 January 2016 if gas is used for cooking and heating water. If gas is used only in cooking, a meter must be installed by 1 January 2018. It is has been shown in other countries that gas meters reduce consumption by about 30%. Ukraine has now installed more than 10 million meters in households across the country. 71% of homes, accounting for about 90% of family usage, now have meters. The meters are funded by a combination of households themselves, gas distribution companies and the state budget. The rollout is on schedule but EURACTIV was told that it would take more time to reach the remaining households because there were in more remote areas. The Samgaz factory in the Western Ukrainian city of Rivne was founded in 1995. It has produced 2.5 million meters since its foundation and employs about 200 people. It is now working on meters that can transmit data, making it easier for energy companies and consumers to track consumption. Ukraine’s creditors, which include the EU, have called on the country to improve energy efficiency. The energy intensity of Ukraine’s GDP is almost four times higher than the average within the Organisation for Economic Cooperation and Development (OECD), according to the World Energy Council. This means Ukraine could save as much as 50% of its energy consumption through improved energy efficiency. That can create jobs and health benefits as well as boosting energy security. But according to the IEA, the energy intensity of Ukraine’s economy has decreased by just 3.5% – which compares poorly to countries such as Russia and Belarus. Russia has exploited Ukraine’s dependence on imports and on revenue from transiting its gas to the European Union to put political pressure on the country. It has also turned off the taps in the past. Before 2012, Ukraine got all of its natural gas imports from Russia. Last year, about 92% of gas imports were from Russia. Natural gas imports represent 57.2% of all energy imports to Ukraine. Reverse gas flows – when Russian gas customers like Slovakia, Hungary and Poland sell to Ukraine – do help. Last year they reached 0.9 bcm per month by the end of the year. Ukraine will have to increase the amount of gas it buys from Europe. But before that can happen, it must reform its energy sector. State monopoly Naftogaz will be privatised. But that process will have to be compliant with EU competition law if it is to buy gas from Europe. National gas production, which was hit by the seizing of infrastructure in territory now held by Russia-backed separatist rebels, is about 20 billion cubic meters (bcm) a year. Gas storage capacity was also lost to the conflict. Ukraine’s state gas company Naftogaz, which was part of the Soviet Union’s state gas company, estimated that 48 bcm is needed to meet national demand. The International Energy Agency estimates that national gas production could be developed, reaching 27-30 bcm by 2025. But much of the infrastructure is aging and needs investment. Previously some of those costs could have been met with the revenue from transiting Russian gas to Europe. Ukraine is currently the largest transit country for natural gas in the world. About 40% of Russian gas supplies to Europe go through Ukraine. But Moscow has signalled it will not extend a gas contract due to expire in 2019. Ukraine currently transits between 75-85 billion cubic metres (bcm) of Russian gas to European markets every year. There was a record low of 60 bcm in 2014, from about 120 bcm in the mid 2000s. Gazprom has reduced Ukraine’s transit from over 65% of total Russian gas exports to Europe by 2007, to below 50% in 2014. Supplies to Germany, France and Belgium are being routed away from Ukraine via Nord Stream. The Belorussian Yamal, or Northern Lights routes, could also offer lower transportation costs in the future. Russia’s plans to drop Ukraine as a route for pumping natural gas to Europe will leave Gazprom facing about $1 billion in annual transit fees to Slovakia and Bulgaria, according to industry sources. 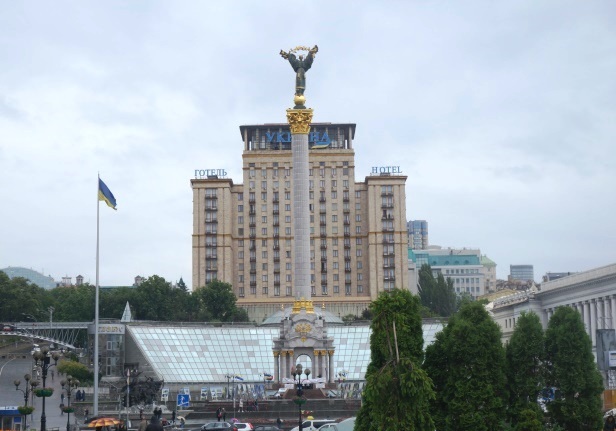 Ukraine has a population of 45.6 million and is the second-largest country by area in Europe at 603 628 square kilometres. It is located at the crossroads of the European Union, the Russian Federation, and Black Sea and Caspian regions. Ukraine holds abundant mineral resources, including oil, natural gas and coal, as well as a large hydro and biomass potential. With its population and strong energy consumption, it is one of Europe’s largest energy markets. It also remains the largest transit country for natural gas in the world and plays a key role for Russian gas deliveries to European markets. In 2014, the Ukrainian government signed and ratified an Association Agreement with the European Union, after the ousting of Kremlin backed leader Viktor Yanukovich. Russia turned off the taps to Ukraine.The resulting shortages in the EU gave political impetus to the Energy Union project, which aims to bolster the bloc’s resilience to such shocks. The annexation of Crimea, and the shooting down of a Malaysia Airlines flight, allegedly by Russian-backed rebels, led to EU sanctions, which still hold. The leaders of Germany, France, Russia and Ukraine gave their support to a deal to end fighting in eastern Ukraine, following 17-hour long negotiations in the Belarussian capital Minsk on 12 February. The four leaders committed to respecting Ukraine's sovereignty and territorial integrity, according to a joint declaration. Western leaders are closely observing the implementation of the Minsk agreement. On 2 March, European leaders said that they agreed that the OSCE needed a broader role as observers of the ceasefire, and weapons removal. Ukraine has asked the EU to dispatch an EU-led Security and Defence (CSDP) mission to Donbas. I find this distasteful, banging on about energy efficiency when people are being killed and much of the Donbass is in ruins. I too find this article distasteful and full of inaccuracies, obviously it was written by a pro Kyivan government sympathizer. Ukraine appears to be on the verge of anarchy with roving bands of maverick battalions seeking revenge in the east and out of government control.